These little pizzette are somewhere in the territory of a pizza but they are made with spelt four, which gives them a deeper, nuttier tone. These little pizzette are somewhere in the territory of a pizza but they are made with spelt four, which gives them a deeper, nuttier tone. Hazelnuts are folded through the base too, and toast as they bake to add an amazingly sweet, nutty backnote. The depth of the spelt and hazelnut base stands up to the clean fresh goat’s cheese and caramel onion topping and the nourishing green from the wilted spinach. I serve these for a crowd, or with a simple salad for an offbeat supper. Weigh all the dry dough ingredients into a mixing bowl. Add the warm water bit by bit, mixing as you go. Then add the oil in the same way. Mix until the whole lot comes together as a dough. This can be done in a stand mixer (like a KitchenAid – using the dough hook) or a food processor. Knead the dough until it’s elastic and super-stretchy. This will take 15 minutes by hand or 10 minutes if done in a mixer. Don’t skip on the kneading, as this is what will give a great dough. Once it is a smooth, even, springy ball, put the dough back into the mixing bowl, cover and leave in a warm place to rest for 1 hour or so – it should double in size. Once it has risen, tip the dough on to a clean work surface and divide it into 8 equal pieces. Mould each piece of dough into a tight round roll. Slosh a good glug of rapeseed oil into a big roasting tin and roll the dough balls around, coating each one with oil. This’ll stop them proving into each other and give the pizza base a lush crust. Leave the tin of pizza bases covered in a warm place to rise for another 30 minutes. Meanwhile, fre your oven up as hot as it’ll go – anything above 240°C/ fan 220°C/gas 9 is good. Place a pizza stone or a heavy baking sheet in the middle of the oven to heat up. Now on to the toppings. Fry the onions slow and low for about 15 minutes in a little olive oil, until soft and sweet – then add the spinach and nutmeg. Set aside. Chop the garlic with the marjoram until fine and mix with the oil. Once the dough balls have had their fnal 30 minutes’ rise, carefully roll each one into a rough circle, patching up little holes that the crushed hazelnuts might make. Top with the marjoram oil, spoon on the spinach mixture and dot with the goat’s cheese or ricotta. 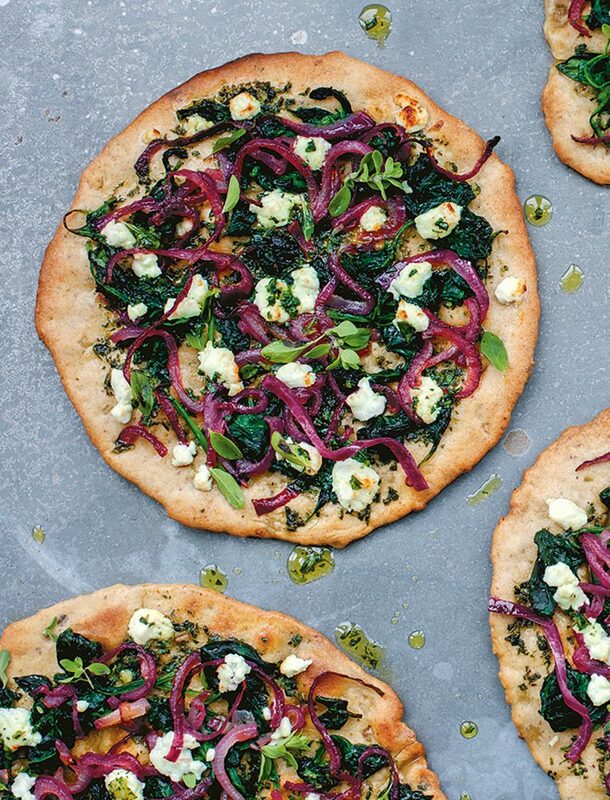 Bake on the pizza stone or baking sheet in the super-hot oven for 8–10 minutes. Eat the pizzette as soon as they are cool enough.